Like a spark it will burst into flame if we give it space, air and fuel. Ignited, it becomes a burning passion "energia vitale"
that allows us, ordinary people, to do extraordinary things. 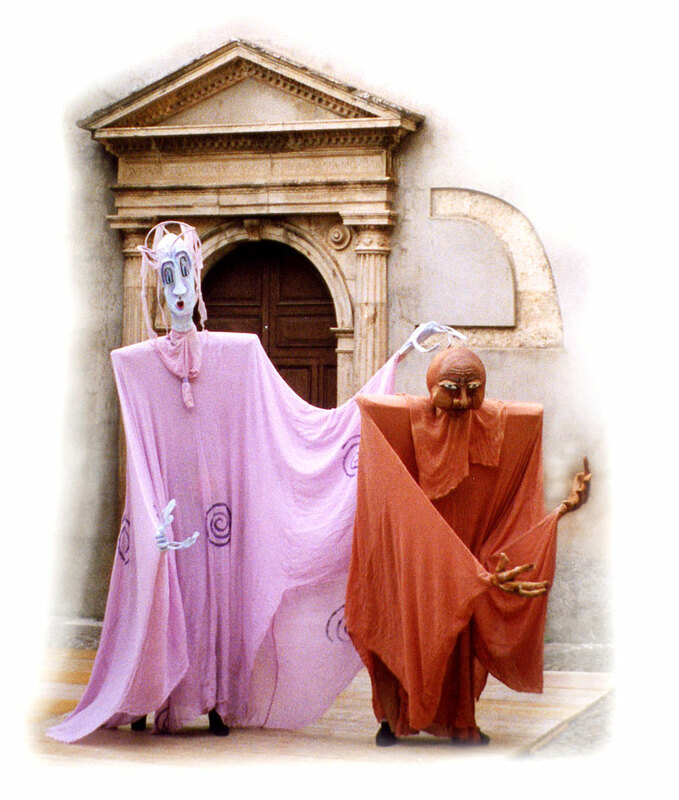 Spiritree creates unique performances by intertwining gestural theatre and the visual arts. Each performance evolves as the artists construct scenery, sculpt masks, create giant body puppets, compose poetic texts and choreograph expressive gesture and movement. Spiritree’s installations are collaborative works that bring together the expression of several individual artists who share a common theme or format. Masks are sculpture to be worn. If the artist is able to capture the essence of a character or creature, the mask will render the subject effectively. The mask must also become one with the actor/actress who wears it. The mask maker must simultaneously use the originality, spirit and eye of an artist while skillfully crafting the piece as an artisan. 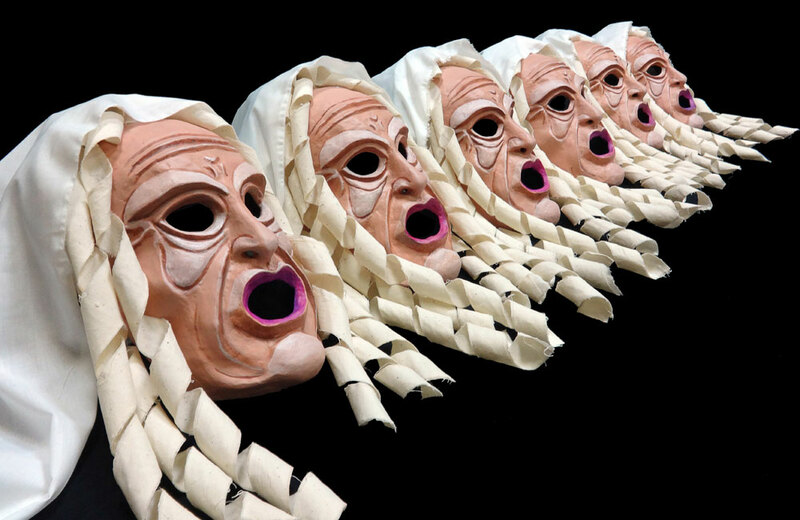 In this way, the mask can convey its own emotions and yet respect the structure of the wearer’s face along with his/her energy in bringing the mask to life. In Spiritree workshops, people from all walks of life are invited to explore their creative energies both individually and as part of a group. Spiritree offers a warm and supportive setting for taking the leap into self discovery through art-making. For adults, Spiritree offers workshops on the papier mâché techniques used in the creation of sculpture, masks and objets d’art. Spiritree also holds experiential workshops in art making, creativity, and gestural expression to kindle the participant’s quest for well being. In schools, Spiritree offers theatre and visual art residencies as an innovative approach to learning. 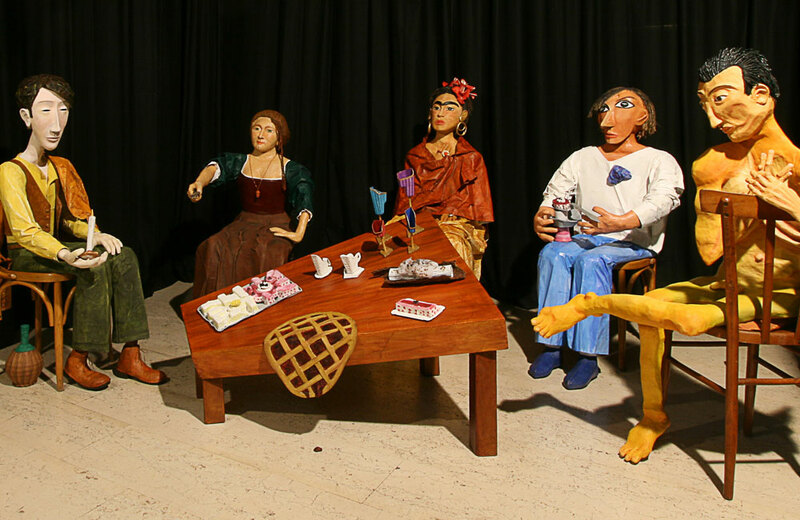 Creates masks, props, giant puppets and sculpture in papier mâché on commission for theatre companies. Creates performance art pieces which have been presented at events such as the Lincoln Center Out-of-doors Festival in New York City, First Night Morris County, the Urban Theatre Festival in Rome and since 1994 in various locations, as the culmination of summer workshops in art and creativity. Conducts residencies in public schools which focus on the integration of the arts in the learning process. 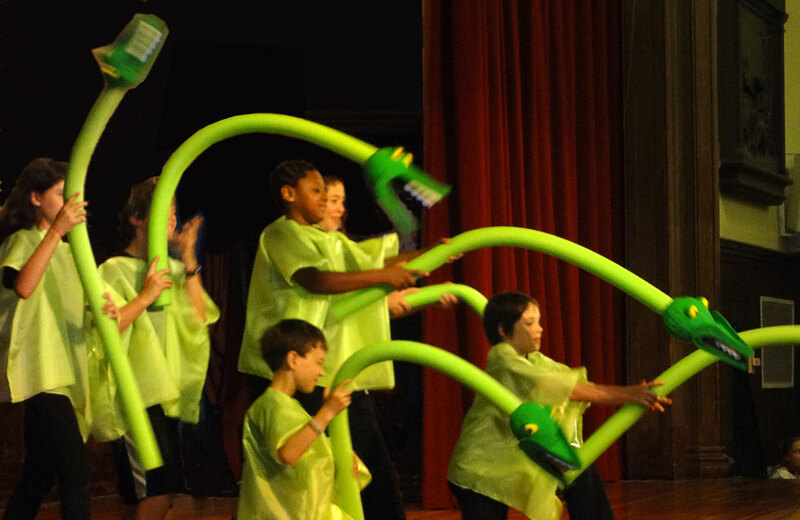 Since 1989 Spiritree has collaborated with the New Jersey State Council on the Arts and Morris Arts in their Artists-in-Education programs. Facilitates both professional development workshops and experiential workshops in schools, cultural centers and for social organizations. Holds a permanent workshop on the art of papier mâché and on-going courses in numerous forms of paper art at the Bottega of Spiritree. In addition, the Bottega offers experiential workshops focusing on art making, expressive gesture and movement to promote harmony and well being .